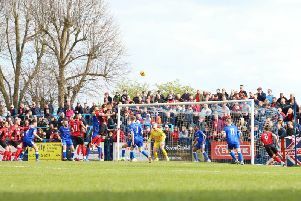 Kettering Town produced yet more last-gasp drama as they took a firm grip on the Evo-Stik League South Premier Division Central title race with a 3-2 success over Needham Market at Latimer Park. After Tom Knowles had been the unlikely hero with the late winner at Stourbridge last weekend, this time it was the turn of Lindon Meikle to set the pulses racing as he blasted home in the fourth of five minutes of stoppage-time to send the frozen Kettering faithful wild. And Meikle’s finish to the game summed up the character this Poppies squad are beginning to show as they bid for promotion. The midfielder looked to have missed the golden chance to win it in the final minute of normal time when he scooped the ball over from a great position after good work from substitutes Rhys Hoenes and Brett Solkhon. But Kettering kept plugging away and Meikle eventually atoned for that miss as he skipped past a challenge on the right side of the area before rifling his shot into the far top corner from a narrow angle. That gave the fans another moment to make them believe and, indeed, this was a day for the volunteers and fans. After a sharp frost overnight, the game only went ahead after fans and volunteers helped get some heaters onto the Latimer Park pitch to thaw out one of the goalmouths. The match got the go ahead after an inspection and, despite their team making it hard for themselves, those who made the effort were rewarded in the appropriate manner. In the end though, there could be few arguments as Kettering did more than enough over the 90 minutes to justify the three points. They started brightly with Ben Milnes, who was immense in the middle of the pitch, sending an early effort wide before visiting goalkeeper Jake Jessup batted away Michael Richens’ 30-yard strike. The Poppies were presented with a golden chance to open the scoring on 18 minutes when Meikle’s cross struck the arm of a Needham defender. Dan Holman stepped up and sent Jessup the wrong way but got the kick horribly wrong as it skewed wide of the post. Aaron O’Connor was unusually off target with a free header but it didn’t take long for him to make amends as he broke the deadlock. Holman switched the play to find the on-rushing Gary Stohrer in the right channel of the area and his first-time cross was gobbled up by O’Connor despite Jessup getting a hand to it. But the visitors responded well to that and Paul White produced two excellent saves, one from Jamie Griffiths and the other from Joseph Marsden’s curling shot before the latter threw a spanner in the works on the stroke of half-time. And there was nothing White could do as Marsden took aim with another curling effort which found the far corner. With the pitch deteriorating, the Poppies really had to dig in and Meikle tested Jessup after one of those trademark driving runs into the area. O’Connor shot over from a good position and Jessup made another save to deny Holman before the Poppies regained the lead with 18 minutes to go. Richens sent the ball forward, Holman flicked it on and O’Connor raced away before sliding the ball home. That looked to be the winner but Needham kept going and they got a break when a lapse in concentration in the Poppies’ backline resulted in Marcus Kelly being adjudged to have fouled substitute Jeremiah Kamanzi in the area. It looked soft but Marsden stepped up to beat White from 12 yards. With that, it looked like being a day of frustration for Kettering until Meikle’s late intervention. With Stourbridge falling to a third defeat in a row, the Poppies are now five points clear at the top with two games still in hand. No trophies are being handed out yet but these late goals are putting Kettering in a commanding position. Poppies: White; Stohrer (sub Kelly-Evans, 63 mins), Stanley, Rowe-Turner, Kelly; Meikle, Richens, Milnes; Holman, Cunnington (sub Hoenes, 60 mins), O’Connor (sub Solkhon, 75 mins). Subs not used: Knowles, Graham. Needham Market: Jessup; Dye, Baker, Morphew, Sturgess (sub Mills, 49 mins); Ingram, Heath, Squire, Marsden; Dobson (sub Kamanzi, 68 mins), Griffiths. Subs not used: Pelling, Cook, Bursa. Goals: O’Connor (25 mins, 1-0), Marsden (44 mins, 1-1), O’Connor (72 mins, 2-1), Marsden pen (80 mins, 2-2), Meikle (90 mins, 3-2). Bookings: Cunnington (foul), Richens (unsporting behaviour). Northants Telegraph man-of-the-match: Ben Milnes - It may have gone unnoticed by some but the midfielder was outstanding. Often tagged as a good footballer who is better on pristine surfaces, he got stuck into the battle and really made the Poppies tick. His passing was, on the whole, impeccable, and even in the final throws of the game after the winner had been scored Milnes was there with a clearing header after Needham Market had been awarded a free-kick in crossing range. Not one that would have stood out to many but an excellent afternoon for Milnes.